Biodiversity conservation is a key global sustainability issue. Land use change due to expansion of agriculture, tourism, and development projects is contributing to loss of habitat and species at an alarming rate. Moreover, indiscriminate logging of forests for immediate monetary need is further degrading forests and habitats. This is particularly true for biodiversity areas and ecosystems in the forest landscapes of northern Western Ghats - a global biodiversity hotspot. The situation is exacerbated by a sparse protected area network, the predominantly community ownership of large tracts of biodiversity rich forests, a lack of awareness on the importance of biodiversity in human well-being, and low economic returns from sustainable utilization of biodiversity. Sacred groves - traditionally managed old growth forest fragments that exist in good numbers across the region – offer some hope for the conservation of threatened plants and animals. Yet these areas are facing the consequences of the loss of faith in tradition among the local community. There is thus a growing threat to the ecological integrity of landscape, together with a need to develop a strategy that fulfils monetary expectations of local communities whilst ensuring conservation of key biodiversity areas. With this in mind, AERF implemented the international FairWild certification scheme for the sustainable collection of non-timber forest products from community managed forests in the North Western Ghats. FairWild articulates stringent protocols and requirements with respect to biodiversity conservation, sustainable harvesting methods, monetary benefits to resource owners, ownership of and access to target resources, and the equitable sharing of benefits. Terminalia bellirica and Terminalia chebula were the selected target species based on established demand for their fruits in traditional medicines in India and abroad, the potential for sustainable harvesting, the opportunity for improving economic returns, and the associated conservation benefits. AERF conducted a resource assessment of the trees, cost-benefit analyses and a social feasibility study to understand the potential of this certification scheme. Twenty-five villages were selected for a resource assessment of T. bellirica, while the assessment of T. chebula was carried out in four villages from Sangameshwar and Bhimashankar. Selecting collectors and conducting trainings to build their capacity in sustainable collection and processing of fruits were necessary parts of compliance for FairWild certification. Successful implementation of FairWild certification has provided direct economic benefits to 100 households while protecting up to 600 large trees of Terminalia bellirica and nearly 1,000 old trees of Terminalia chebula in the North Western Ghats. The conservation of biodiversity in human-dominated landscapes is substantially influenced by the extent to which particular values – cultural, spiritual, and economic – attached to the resource, are respected. In India the forces of globalization have led to severe deterioration in cultural values associated with natural resources, and efforts have been made to substitute these intangible values with monetary ones. On one hand this has precipitated exploitation of natural resources in a rampant and unsustainable manner, posing serious threats to the stability of ecologically important and irreplaceable places such as the forest ecosystems of the Western Ghats—a global biodiversity hotspot. On the other hand, there are opportunities to save biodiversity through sensible and careful use of economic instruments. The medicinal plants sector, though highly promising in terms of providing opportunities for economic development alongside biodiversity conservation at the landscape level, has seldom delivered on these expectations. Unfair market practices and near complete disregard for the ecological sustainability of the resource are two key reasons behind the failure of this sector. Local extinctions and declines in healthy populations of many economically important medicinal plants provide sufficient evidence for these unsustainable practices. Management practices which are ethical, inclusive and economically viable can likely provide a sustainable alternative for biodiversity conservation and livelihoods. In this regard, the principles and criteria of FairWild certification valuably address these critical issues in the medicinal plants sector and therefore may have the potential to generate success stories in conservation whilst promoting economic growth based on the use of natural resources. The importance of certification schemes in addressing environmental and development issues is now widely accepted, although just how successful they are in achieving their objectives and meeting their aims has long been an issue of contention. Indeed, it is difficult to envisage a situation in which such schemes will avoid disadvantaging some people or precipitating unintended negative consequences. However, it is also true that many schemes have been successful from the consumers’ point of view. For instance, products bearing the Fairtrade label have now become the purchase of choice for many consumers around the world who are willing to pay the additional premium cost these products bear. FairWild is a relatively recent certification scheme of this type, having been founded in 2008 and based on the International Standard for Sustainable Wild Collection of Medicinal and Aromatic Plants (ISSC-MAP), itself rooted in the Good Agricultural and Collection Practices (GACP) framework. Its development was supported by the German Federal Agency for Nature Conservation (BfN), TRAFFIC, WWF and IUCN, who were driven by a recognition that the increasing demand for wild plants – as ingredients for food, cosmetics, well-being and medicinal products – poses major ecological and social challenges. Pressure on potentially vulnerable plant species was recognized as endangering local ecosystems and the livelihoods of collectors – people who often belong to the poorest social groups in the countries of origin. In response to these concerns the FairWild Foundation was set up to promote the FairWild Standard and establish a certification system for the sustainable management and collection of wild plants. These institutions aim to provide a worldwide framework for implementing a sustainable, fair and value-adding management and trading system for wild-collected natural ingredients and products thereof. The foundation’s mission is to “…enable transformation of resource management and business practices to be ecologically, socially economically sustainable throughout the supply chain of wild-collected products” through the provision of “…a worldwide framework for implementing a sustainable, fair and value-added management and trading system for wild-collected natural ingredients and products thereof” (FairWild.org 2018). FairWild certification seeks to ensure that buyers know they are supporting fair trading, with the products being legally and sustainably sourced, and the benefits being felt by all those involved right down to the local communities harvesting the wild plants. With the scheme still in its infancy, the number of FairWild certificates awarded remains small. The latest published information records some 30 implementation projects around the world, but just 34 live certificates (they are renewable each year) that cover 18 plant species at different locations (FairWild Feb. 2017). Of these projects, 27 are in six, predominantly eastern, European countries, of which 14 are in three Balkan states (8 in Bosnia-Herzegovina, 5 in Bulgaria). Of the rest, four are in former Soviet republics, and only three are operating further afield – one in Zimbabwe and the two in India that are the subject reported here. This paper presents an ongoing project implemented in the North Western Ghats of India, where an approach articulated through the FairWild certification scheme is being employed as a mechanism for promoting biodiversity conservation, the sustainable collection of target species, and economic growth. The North Western Ghats is a recognized Global Biodiversity Hotspot, yet has a rather sparse protected area network, largely because the great majority of the forest landscapes that comprise it are privately owned. According to the study carried out by Pune-based NGO WRCS in 2013, in the five districts of the northern Western Ghats including Satara, Sangli, Kolhapur, Ratnagiri and Sindhudurg, of the total forest area of 17, 699 km2, 12,043 km2 are owned and managed privately, while 5,656 km2 of forest area (less than 50% of privately managed land area) is owned and managed by the government (Kulkarni & Mehta 2013). In the absence of a sound, comprehensive policy for the sustainable management of biodiversity on these private lands, subsidy-driven monoculture plantations, coupled with a lack of knowledge on economically viable sustainable management alternatives, is resulting in mass-scale deforestation and degradation. The Applied Environmental Research Foundation (AERF), a conservation NGO based out of Pune, is the implementing partner in a FairWild project focused on the protection and sustainable exploitation of medical plant resources in the North Western Ghats. AERF set up the “My Forest” initiative in 2007 to address the issue of deforestation in this region. Under this program, AERF decided to offer a financial incentive to the marginal and economically weak farmers, those most in need of gathering firewood and timber, for not logging the forests. A “conservation agreement” is signed between the farmers and AERF for this purpose and lasts for a minimum period of five years. The progress of this approach was slow in the initial years as it was a completely new way of looking at forests, and was therefore somewhat confusing for the farmers. However, more and more farmers joined this initiative once they began to think about resources in a more holistic and long-term way. Through this initiative, AERF has secured long-term protection for 2,000 hectares of forests until 2022. However, although this is a small but significant step forward in halting deforestation, it is also necessary to create a revenue model based on sustainable use of this vast resource in order to create the financial self-sufficiency necessary to sustain this conservation initiative in the long term. In pursuing this objective, AERF identified the FairWild certification program as offering a potentially valuable tool for addressing important sustainability issues of biodiversity conservation, and in 2012 conducted a feasibility study, short-listing two districts for possible implementation of FairWild certification. Crucial motivation for this feasibility study was provided by active involvement of Pukka Herbs Ltd. – Europe’s leading manufacturer of Ayurvedic products. Pukka Herbs expressed interest in purchasing FairWild certified primary processed fruits of Terminalia bellirica and Terminalia chebula trees, two of three ingredients that comprise a key Ayurvedic preparation – Triphala. This led to the selection of two areas in which to explore the possibility of implementing FairWild certification. The first, the Bhimashankar Wildlife Sanctuary in the North Western Ghats, is traditionally known for collection and sale of T. chebula by the tribal community, the Mahadev Koli. The second area, the forest landscapes from Sangameshwar block in Ratnagiri district, is rich in populations of Terminalia bellirica trees, many of which are located in sacred groves. These sacred groves are old growth “oases” protected by their religious significance that are critical in maintaining biodiversity by providing reservoirs of biodiversity colonizing capacity and “stepping stones” for species moving through the landscape. By July 2012, AERF had taken steps towards making a stronger business case for biodiversity conservation through setting up some demonstration projects, and established a private limited company, Nature Connect India Pvt., Ltd. (NCIPL). NCIPL came in very handy as vehicle for implementing FairWild certification in years to come. Following a preliminary assessment of the potential impacts for conservation and rural livelihoods, in partnership with academics from the Durrell Institute for Conservation and Ecology (DICE) in the School of Anthropology and Conservation at the University of Kent, in June 2013 AERF secured three years of financial support through the UK Government’s Darwin Initiative programme. This was supplemented by a small support grant from the Keidanran Nature Conservation Fund (KNCF) to specifically promote the FairWild approach. This funding enabled AERF to conduct situation analyses, run capacity building training sessions with the local communities, carry out trial collection exercises, and purchase and install equipment for primary processing (drying and pulverizing) of the collected fruits. In presenting this project, this paper reports the project approach and process, the benefits, problems and issues that it has generated. Likewise, the paper considers the potential of this approach for fostering long-term, ecologically sustainable livelihoods based on the harvesting of non-timber forest products (NTFPs). For a product to be sold as “FairWild Certified” all those directly involved in the national and international supply chain need to be assessed and approved. This includes: collectors, collector associations/co-operatives, manufacturers/NGOs contracting collectors, manufacturers/processors in the country of origin, traders and exporters in the country of origin, importers, processors and even marketing companies in the consumer countries (who can become certified on a voluntary basis). The certification award is based upon: a detailed resource assessment, a viable management plan, sustainable collecting practices, cost calculations along the full supply chain, the traceability of goods and finances, and documented fair trading practices. In addition, no producer organization can become certified without an on-site inspection. Since organizations can have many, sometimes hundreds of, collectors, not all can be individually visited. Thus, the purchasing company and collectors are certified as a group and therefore need to operate an internal quality assurance system. FairWild Certification enables companies to show and communicate to the end consumers that their products are sourced and produced in a socially and ecologically sound way, so that benefits are felt by all those involved right down to the local communities harvesting the wild plants. Following a broad resource assessment, AERF identified specific collection sites in the two districts selected for FairWild implementation activities. Additionally, organic certification has also been undertaken at both the locations for all the resource areas. The organic certification guarantees that the collected material is not contaminated by pesticides or other harmful chemicals, qualifying the produce as acceptable for human consumption in the UK. The two principle project sites are around the villages of Dhagewadi, Bhimashanker and several villages in the vicinity of Sangameshwar, both located in the North Western Ghats, Maharashtra, India. The figures show the location of these sites and the main nearby distributions of T. bellirica and T. chebula. Within the Bhimashankar Wildlife Sanctuary, the Mahadev Koli village of Kondhwal, which is dependent on the surrounding forest area for a large part of its subsistence, was chosen. This community collects firewood and T. chebula (“haritaki”) fruits from the forest lands under their ownership, with the haritaki being sold to meet immediate cash needs. In conducting a FairWild project feasibility study, AERF recognized that if the haritaki fruits received FairWild certification, the collectors could get an increased price for their harvest and this would encourage conservation of the resource, which is mainly comprised of large groves of T. chebula with a richly diverse floral understory. The FairWild premium, a percentage of the export value of the product returned to the community for its own development purposes, could then be used for projects such building a bio-gas plant and/or improving sanitation. AERF had already conducted conservation projects in this region at a local level, enabling their field experts to have built an excellent rapport with the locals and become familiar with the key biodiversity, socioeconomic and geographic factors and issues. This was invaluable for the successful conduct of a socioeconomic survey of the village and resource assessment with the support of the villagers, as well as in communicating the benefits of the FairWild certification to the local collectors. Kondhwal village in Bhimashankar Wildlife Sanctuary is comprised of four separated settlements (“wadis”) made up of varying numbers of households: namely Gavandewadi (65), Kondhwal and Dhagewadi (33 each), and Shindewadi (6). The survey addressed the populations of all four wadis, with the data collected from nearly 150 families including: family size/no. of dependents, area of land owned and uses to which it is put, crop yields, location and number of haritaki trees owned and harvest data, and annual household income and sources and details thereof. As predicted, the villagers’ livelihoods are predominantly focused on rice cultivation to ensure their survival. However, they were also found to depend on income generated from other sources, of which haritaki, primarily in the form of the young fruits (“hirda”), accounted for nearly 50%, wage labour about a third, milk from cattle another 10%, and rice and honey sales another 8% and 3% respectively. It is also true that some young people are employed in small towns or cities. However, they repatriate little of their income. The steady rise in income from collecting and selling of certified fruits of Terminalia chebula has started attracting local unemployed youth to this initiative for potential employment. While the project engaged about five young members of the community in collecting and processing in the year 2015, there are a total of 15 young men and women who participate in the project activities at different levels of the supply chain in the Bhimashankar Wildlife Sanctuary. 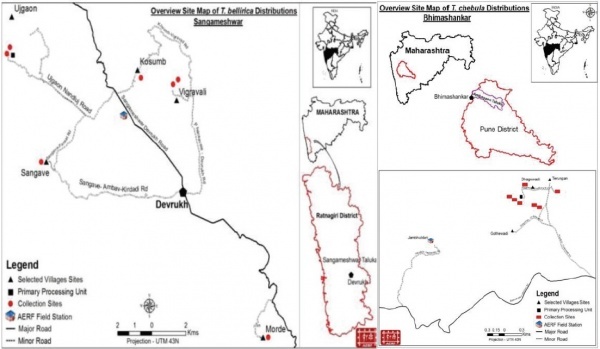 Similar data sets were gathered from the other study site, a collection of villages close to sacred groves in the Sangameshwar block in Ratnagiri district hosting mature specimens of Terminalia bellirica. Here the objective was to build a picture that included the specific role of T. bellirica and the sacred groves in conservation, and also to develop a means of enhancing the livelihoods of marginal/subsistence farmers—members of the local community with little or no cash income. The process flow chart (Figure 3) shows various activities carried out in establishing the FairWild certified supply chain, along with the role of each stakeholder group in the northern Western Ghats. With the setting up of processing equipment and facilities at both sites, together with the training of selected locals and articulation of the project within the framework of the FairWild standard and protocol, a pilot exercise conducted by TRAFFIC International, Japan in 2013 was followed by the official FairWild assessment visit and award of the certificate for the fruits of both Terminalia species, first in 2015 and then again in 2016. In 2015, 3.6 tonnes of T. chebula fruits and 2.6 tonnes of T. bellirica fruits were collected under the FairWild standard, and 4.9 tonnes of T. chebula and 4.6 tonnes of T. bellirica in 2016. Complete supply chains were also established and substantial volumes of semi-processed fruits (husks) were delivered to Pukka Herbs Ltd. in the UK (3.2 tonnes in 2015; 4.4 tonnes in 2016) through the Indian export company Phalada Agrosciences, Bangalore. Most importantly, the certification process under the project established a significant income source for 10 collectors in the Sangameshwar block, nearly 100 individual collectors in the Bhimashakar Wildlife Sanctuary, and three marginal farmers at each site who were trained and employed in the maintenance and operation of the processing equipment and record keeping. As the demand for the FairWild certified fruits increased, additional sites were brought under FairWild certification in the year 2016. This has resulted in a substantial increase in collection of certified fruits in 2017. For example, a total of 7,200 kilograms of Terminalia chebula fruits have been collected and processed in Bhimashankar, while in Sangameshwar, a total of 5,200 kilograms Terminalia bellirica have been collected and processed. Ultimately, a total of 5,500 kilograms of certified processed fruits of both species were supplied to Pukka Herbs, UK in 2017. When compared with local market prices for uncertified fruits, a significant rise in income for the farmers supplying certified fruits to processing centres is evident. In 2015, the local market price for high quality Terminalia chebula fruits was INR 6/kg, while certified Terminalia chebula fruits brought in INR 12/kg, an increase of 100%. Moreover, this price is paid to the farmer at the processing centre which is set up in the village, thus saving the cost of transporting the material. Additionally, the farmers are paid the total compensation on delivery of the certified material on spot, while in the local market they have to wait up to one month to get the money from the sale of materials. In terms of biodiversity benefits, the establishment of sustainable collection practices under the FairWild protocol has contributed to the conservation of 27 groves of T. chebula spread over 26 hectares. Meanwhile up to 750 large T. bellirica trees and their habitats, spread over 32 hectares across 11 villages, have been conserved in the Sangameshwar block, of which up to 400 have achieved FairWild certification. The ecological importance of T. bellirica is particularly noteworthy because many of the individual trees in question are large mature specimens that provide nesting sites for important seed dispersers. Thus, this project ensured the protection of 28 nesting sites of the Malabar pied hornbill (Anthracoceros coronatus) and five nesting sites of the great pied hornbill (Buceros bicornis). India is one of the signatory countries to the Nagoya Protocol, which was ratified by the Ministry of Environment and Forest (CBD nodal agency) on 14 July 2014. Thus, it is now imperative that suitable institutional mechanisms are put in place for implementation of Access and Benefit Sharing (ABS). The National Biodiversity Authority and respective state biodiversity boards were given the mandate for implementation of ABS in India. The state biodiversity board of Maharashtra where the FairWild project is being implemented invited AERF to become the nodal organization for setting up biodiversity management committees – village level institutions vested with governing authority for sustainably managing biodiversity within villages. While this was a welcome and important step towards collaboration with the local government for implementation of ABS, it turned out that implementation through the government route was marred with impractical regulations, and thus the process came to a halt. As per regulations, the company sourcing raw material for manufacture and/or trading is supposed to pay a certain percentage (1.5% to 5%) of turnover as a royalty to the state biodiversity board, which in turn is to pay the respective biodiversity management committees about 85% of the royalty for conservation management of the village resources. While this is fine as a regulation, many doubt the intention and ability of the government to share the royalty with the village committees. On the other hand, through FairWild certification, the buyer pays between 10 and 30 percent of the total value of the purchased material from the respective village to the village collector committee as a premium fund every year. This fund can be used for any social work that the village committee finds appropriate. In this manner, the FairWild premium has significant overlap with ABS regulations. Thus with the FairWild certification scheme, distribution of benefits is more transparent, practical and easy to implement. To date this project has had major positive effects on the individuals and communities it has targeted, both human and non-human. However, it has also generated significant additional benefits beyond the pragmatic economic and ecological ones already described. In particular, the FairWild demand for documentary evidence of ownership of the resources being exploited, together with the intensive capacity-building sessions and other documentary requirements of FairWild and Organic certification, has helped these communities recognize and act upon the need to put their land records in order so that they can officially claim the ownership of the trees standing on their land. Similarly, they have come to a much better understanding of the nature of markets and the means by which consumer demands for good quality products can be more effectively met by changing their harvesting and processing practices, as well as how additional income can be generated by adding value at the beginning of the value chain. There was also the realization that these markets are not just local or regional, but extend across the planet, thereby connecting what is happening on the ground with global processes and understanding – thinking globally whilst acting locally. A qualitative study by Sardeshpande (2016) of key informants along the value chains of the project provided valuable further insights into the impacts of this FairWild approach. Sardeshpande conducted semi-structured interviews with collectors (2), facility managers (2), project partner at AERF (1), DICE (3), TRAFFIC (2), and Pukka Herbs, Ltd. (1), as well as representatives of other firms also engaged in biodiversity value chains (2). These interviews examined the pros and cons of certification, its challenges and prospects, market dynamics, and economies. The resulting data was illuminated with those from an online consumer survey (81 respondents) which explored product labelling, willingness to pay for FairWild certified products, the demand for certification in different product categories, and the perceived impacts of certified collection on forests and communities. The evidence thereby generated supported the view that certification in general was unanimously regarded as making a very positive contribution to the marketing of NTPFs, although, at the same time, not seen as a panacea. More specifically, the implementation of FairWild principles in the context of this project was recognized as precipitating good management practices, equitable trading, and significant capacity building. It was seen to have provided vital monitoring of the resource, together with a degree of transparency that encouraged trust between the participants, which in turn would allow for long-term strategic planning. At the same time, the FairWild certification was believed to have acted as an important vehicle for integrating and promulgating socioeconomic and environmental ethics. Consumer respondents, though mostly (70-90%) found to be unaware of FairWild by name, overwhelmingly declared support for such schemes and indicated a willingness to pay a 15% premium for FairWild certified products once the schemes had been explained to them. Interestingly, the range of perspectives differed between the different stakeholders. Whereas collectors and managers tended to emphasize aspects of landscape conservation and community participation, project partner representatives emphasized livelihood benefits and those associated with certification. Likewise, the buyers highlighted the investments required to achieve long-term sustainable returns. Collectors and source managers also perceived the certification scheme as an important means of incentivizing the conservation of otherwise undervalued and overexploited ecosystems, emphasizing the need to develop many more value supply chains of this type and to involve communities in adopting more sustainable use of the land. Further development was envisioned to make NTFP collection resilient to seasonality and market dynamics, to allow the practice to be extended to other forest fragments, and, through planting interventions, enable degraded habitat to be restored whilst providing sustainable livelihoods. India’s Biological Diversity Act of 2002 (BDA) calls for the formation of Biodiversity Management Committees (BMCs) which catalogue their local biodiversity in detailed Peoples’ Biodiversity Registers (PBRs). BMCs and PBRs have already been successful in a few states, notably Karnataka, Kerala and Madhya Pradesh, but only sparsely adopted in most other states (NBA 2016). In this context certification-related inventorying may help bolster PBR efforts, particularly if the premium fund model proves to be an efficient mode of distributing benefits to the community. The certification implementation process can thereby act as a means of making the community as a whole accountable for and a stakeholder in forest conservation. However, the magnitude of the impact of the fund on communities is debatable because the amounts raised in the context of small volumes of product only afford the purchase of small household or public utility items such as pillows, detergent, and waste bins. This reiterates the need for larger product volumes and/or multiple supply chains. Botanical medicines are used by a majority of the Indian population. Thus, incorporating certified products is likely to generate multiple benefits for biopharmaceutical companies to consider, particularly given the growing middle-class constituency whose values are progressively aligning with those that underpin the FairWild certification. However, it cannot be over-emphasized that despite all the positive aspects that this certification exercise has produced, it has been very expensive from a financial point of view. The cost of achieving FairWild certification was in the region of USD 15,000 in pure monetary terms, not including the value of the time and other resources contributed by the individuals and organizations involved. Without the funding and support provided by the Darwin Initiative, the Keidanran Nature Conservation Fund, AERF, DICE-SAC, Pukka Herbs, and TRAFFIC, it is highly unlikely that FairWild certification would have been achieved. Accordingly, the resource requirements must be effectively addressed if the successes identified in this project are to be duplicated elsewhere. Finally, on a more positive note, it is worth highlighting the fact that this project was also innovative in bringing together stakeholder groups with quite different agendas – communities, NGOs, a private business, and an academic institution – in order to pursue a single cause: combining good practices and economic incentives to simultaneously benefit community development and biodiversity conservation. All participants reported that although they had been challenged at times by certain aspects of this institutional diversity, they had learnt a considerable amount in the process and were eager take the project forward in further collaborations. The following list of plants, birds and butterflies documented from a single FAIRWILD certified site in Sangameshwar provides a glimpse into how much of the regional biodiversity can be conserved by providing positive economic incentives and skill building. The FAIRWILD certification project was initiated in 2012 and we were able to complete the certification process in 2015. We express our deep gratitude to the unwavering support of our partners notably, the Conservation Leadership Program, Critical Ecosystem Partnership Fund, Darwin Initiative, TRAFFIC international, DICE, UK and most importantly, the local communities which collaborated with us throughout this journey. FairWild.org (2018) Mission Statement. http://www.fairwild.org/background. Last accessed 16/01/2018. Kulkarni, J & Mehta, P 2013, A Study of Status, Distribution and Dynamics of Private and Community Forests in Sahyadri-Konkan Corridor of Maharashtra Western Ghats, Technical Report submitted to CEPF-ATREE, Wildlife Research and Conservation Society, Pune. Sardeshpande, M 2016, ‘FairWild in India: realities of a NTFP certification’, DICE-SAC, University of Kent, Unpublished.